Yet, quietly – behind the scenes – a remarkable and no less world-changing revolution is taking place. Georgia, we met many other wonderful Noahide families who are finding a new and gratifying life of meaningful spirituality by way of emuna. That's not all; religious Jews who grew up in oppressive and stringent homes are now discovering the true sweetness and joy of Judaism by virtue of learning about emuna, what a Jew really believes in. People who yesterday were frantic about their problems and living high-anxiety lives are now tasting their first dose of inner peace and the tranquility of a life of emuna. I was especially moved when Isaac Farin introduced me before one of my talks in Miami. Isaac is a twenty-eight year old Ph.D. candidate in marriage and family therapy. A little more than a year ago, he was fired from his job as a Marriage and Family Therapist Registered-Intern, while working for an agency that dealt mostly with mental health clients. He told me that he started to think that this agency was treating clients more like numbers than human beings, which created tension between his superiors and him. As a result, he was fired without warning. But, Hashem does everything for the best. Isaac was determined to complete his PhD, and decided to do his doctoral dissertation on marriage and family therapy, based on the principles of emuna he learned from the emuna books of Rabbi Shalom Arush! Isaac is relatively new to Jewish Spirituality, but as he told the audience in Miami, he is a changed person. He has developed his own personal relationship with Hashem especially since discovering personal prayer. As for last year's misfortune, Isaac says, "When I got fired, I thought I handled it pretty well because when I was called into the supervisor’s office I told myself, 'Isaac, you know that you might get laid off or hear something that you might not like, so this is yet another test to strengthen your Faith.' Anyway, I envisioned the three supervisors as they were Hashem’s pawns and I understood that Hashem was firing me, and I left with a smile." Why did he tell me this? 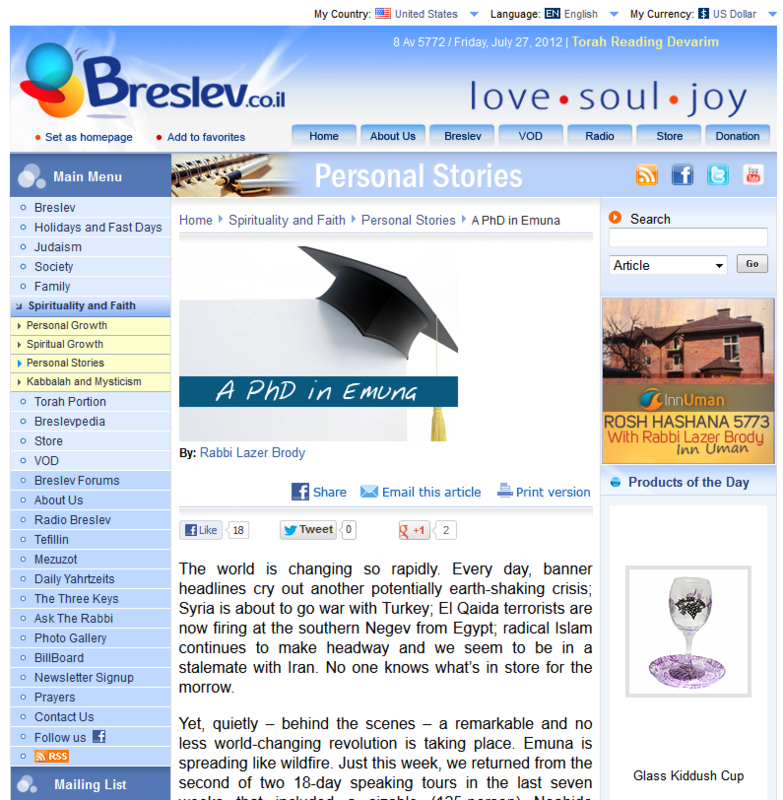 Today, not only is he well on the road to receiving his PhD, but he was offered a better position with a better company and a much better salary also exactly 7 days after he had finished reading The Garden of Emuna (which he lent to a friend, suggested another friend purchase it, and encouraged his brothers and mother to read it). That’s not all – he has become an expert in The Garden of Peace. An hour of Hitbodedut and Tikun Haklali are part of his daily routine. In his own words, "I listen to all of Rabbi Brody's live lectures on the Wednesday broadcasts and then relisten to them. Rav Arush’s teachings have totally changed my life." Not every PhD candidate in psychotherapy says, "After studying Rabbi Nachman’s teachings, I can honestly say, 'I have found the One(s) that my Soul loves' to paraphrase King Solomon, and it is Hashem. I thank Hashem for my family, the entire past-present-future Jewish nation, Rabbi Nachman, Rabbi Natan, Rabbi Shalom Arush, and Rabbi Lazer Brody. Finally, I can say that my getting fired last year was all for the very best, but I would not have been able to see it this way if it were not for Rabbi Nachman’s and Rabbi Shalom Arush's teachings on Emuna. I must thank Rabbi Lazer for making the information available in such a conversational and understandable style. I hope to use what I've learned in helping and counseling others." We certainly wish you success, Isaac. Emuna is the real deal. First, we'd all be advised to learn from the Head Professor of Emuna, Rabbi Shalom Arush, may Hashem bless him always. Then, we can all do a better job of working together to spread the word of emuna all across the globe, amen.